Fall is officially here, and for some dogs, a new season means new allergies. In the fall, dogs are often allergic to weeds like ragweed that pollinate during autumn months. There are various medications made specifically for dogs experiencing allergies, but it’s often helpful to take a few extra preventative measures if you know your pup is prone to seasonal sniffles. We’ve rounded up the best ways to keep the sneezing and itching under control, DIY style. While humans experience allergies via air-transmitted pollen or ragweed, a dog’s allergic center is his skin. The skin on your dog’s paws is an especially vulnerable spot, and allergic reactions can be triggered when paws walk on grass or dig into damp piles of leaves with mold spores. That’s why dogs sometimes chew their paws — they’re itchy! Dipping your pup’s paws into a bucket of cool water when he comes in from the outside can help alleviate allergies and help stop the spread of pollen in your home. It’s good for dogs, too! Fish oil is high in omega 3 fatty acids, which are known to reduce inflammation and can significantly help your allergy-prone dog’s red, itchy skin. Talk to your vet about a favorite fish oil supplement, or start feeding fresh meals that contain fish oil. And to make things easier, most dogs actually like the taste of fish oil. Unlike, say, most people. No dog wants fleas, but allergy-prone dogs need to be especially careful. Dogs can develop an allergy to fleas’ saliva, which not only makes bites worse but can also trigger a whole-body allergic reaction that’s difficult to reduce. Getting a high-quality flea medication and keeping your dog on it year-round is a smart investment for his health. Talk to your vet about options. 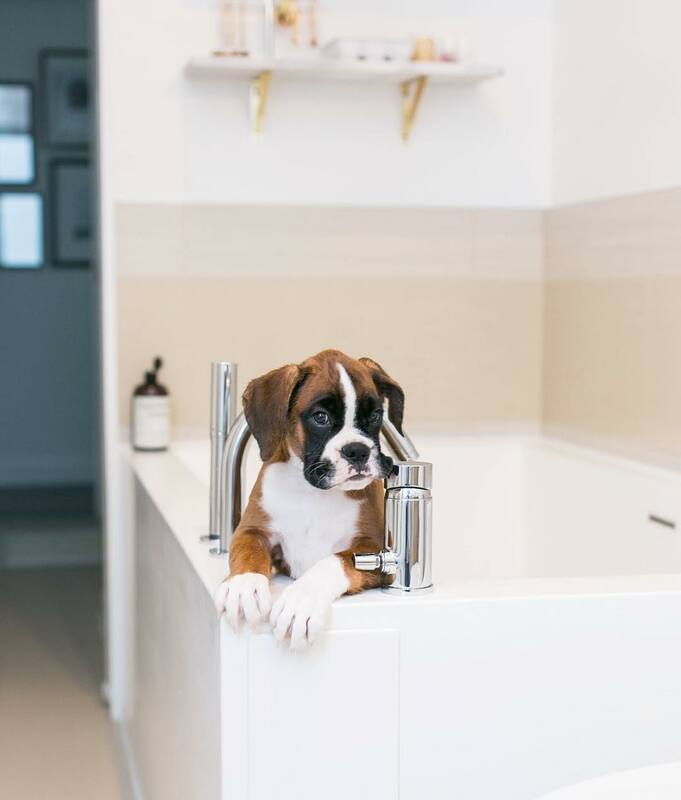 Since dogs contract allergens via their skin, it’s best to double down on bath time if they start to seem itchy. There are plenty of over-the-counter shampoos, conditioners, and sprays with the topical anesthetic pramoxine, which reduces itchiness. The relief only lasts 3-4 hours, but it can be a good temporary fix while longer-lasting allergy medications start to kick in. It might be tough, but keeping your dog away from allergens might be the best move if he’s prone to major reactions. Consider keeping him indoors as much as possible during peak allergy seasons, keeping windows closed, and skipping that long hike. He might miss sniffing around the neighborhood for a few weeks, but it’s better than spending Saturday night scratching.